I remember a new boy in a small town trying to make friends. There was a bag of marbles at the beginning, the contents of which roll down some cobbled streets at the end. In between there was a fantastical tale of gangs, robbery and the use of a fire engine ladder to crawl from one high rise building to the next. I have a vague recollection of an American actor in this French film, a love triangle and, like so many good stories, a little sadness at its end. However I couldn't remember what it was called. I was only around ten years old at the time but for some reason those images have stayed with me for the last 30 years. A few months ago, after having previously searched for the title several times, I found the answer by accident. 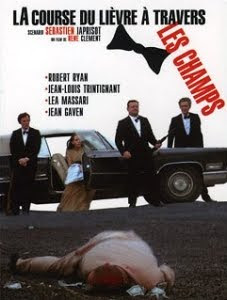 La Course du lièvre à travers les champs or, to give it it's English title, And Hope To Die, was made in 1972 and features a screenplay written by Sébastien Japrisot. I note this as he later wrote the novel A Very Long Engagement, subsequently made into a French film that also happened to cameo a well known American actress, Jodie Foster. Two films made 30 years apart, with the same writer (albeit in a different role), each featuring a well known American actor... and I like them both. At least I think I do. For whilst I saw A Very Long Engagement only a year ago, the memories I have of it's counterpart are fragmented, perhaps even warped over the course of time. And Hope To Die is available on DVD but not, it would appear, with English subtitles. Perhaps this is just as well, though it does sound like the kind of movie I would love to see. I know in my heart if this film was more generally available I would snap it up. Revisiting the past is always a risky venture, and often ends in disappointment, but even a remote chance of re-capturing that childhood magic, if only for a short time, has got to be worth it. Breaking news... Tom is hot. I indirectly gleaned this valuable information from the daughter of my next door neighbour who, in the absence of her Mother, had invited a gaggle of her female friends around for the night. I don't think teenagers have the greatest sense of time and I imagine this is the reason they decided to have a chat in the back garden at gone midnight... for an hour or so... there was even a sing-a-long too. Just after being woken up one of the guests asked "What about your neighbours?" which I thought considerate, until my teenage neighbour replied "Oh no, they're O.K." which was more like it. I'm knackered, but at least I learnt something positive about Tom. Tom, it turns out, is to be much admired due to something about his arms, though I didn't catch what it was that made them so special. Perhaps they're unfeasibly large? Perhaps he can tie his shoelaces without bending down? Perhaps one is longer than the other? Perhaps I should ask? I'd really like to know! Somebody's favourite film is City of Angels. Somebody's favourite song is something that goes along the lines of "dumph... dumph...". You know the one. Everyone agreed that Mark was "sweet". I'm guessing that Mark's arms are perfectly normal. ...and I'm actually managing to bore myself writing this. What it must be like to read I dread to think. But then you've only yourself to blame; any sensible person would have stopped at the word "prototyping". Go and watch TV like a normal person. This week we started the discovery, design and in some case development and I am already tired. My throat is beginning to get sore and I'm under a fair bit of stress. I'm loving it. Sad to say I enjoy my work, despite the overwhelming evidence to the contrary, I actually find it quite creative. 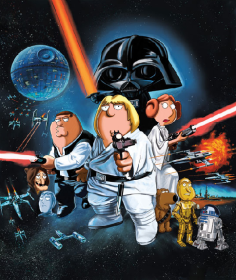 Admittedly like many software developers I've watched Star Wars far too often for someone of my age, but in many other respects I'm quite a rounded individual. Just don't ask me for any examples; I haven't got the time, some idiot estimated we'd be finished by November.